Mom's microwave mooshoori dal (red lentils) recipe. Do tell me if you know of a simpler dal recipe! Today I am going to tell you about a dish which has been a lifesaver for us ever since K and I got married and set up house a decade and a half back. The dish I am referring to is what we call the 'micro masoor' dal. I rarely talk of dishes that I learnt to cook from my mom. This is one. Technically though my mom taught it to my wife and I picked it up from the missus. My mom used to go to teach in the BK Girls College, in far off Howrah, when we were growing up in Kolkata. The job involved around 4 hours of travel for her everyday in crowded non-airconditioned buses on rickety roads. When she came home, she often had to check exam papers or go through lesson plans. Plus our studies too as she was raising my brother and me as a single mom. Cooking was not high on her agenda for obvious reasons. She would cook when we didn't have a maid at home but it was more about putting food on the table and moving on with life than about landing great dishes on the table. I don't think that she really enjoyed cooking but I shouldn't second guess her to be fair. Those were the days before an interest in food became in vogue in India. Now I know of people who say that that their 7 or 8 year olds want to be chefs when they grow up. The ones who don't want to be food bloggers that is! During my childhood in the 80s and 90s, asking my mom for recipes and cooking them was unthinkable. In fact she didn't even allow me in the kitchen to use the gas as that was considered dangerous. So it's rather fitting that this recipe uses very little effort and is perfect for working folks who want to cook. Doesn't require a gas burner either and is child friendly so to speak. The 'recipe', if one can call it so, was taught by my mother to my wife K during the early days of our marriage. Incidentally, both my brother and I are married to working women. My mother would always insist that they, or any girl in general, work. The vagaries of life had taught her the values of being independent. Coming back to the dal, my mother thought of this recipe when she saw the microwave in our house. This was not a very common kitchen appliance in Indian houses at that time. I am talking of the early 2000s. My mother told us to try cooking the Bengali 'dal sheddo'- a simple boiled dal - in the microwave. Both K and I used to share kitchen duties after work those days and my mom suggested this method a time saver. I think we had just got a single burner gas, or possibly not. She suggested using what we called mooshoori dal back home in Kolkata. It is known as orange masoor here in Bandra or red lentils in English. It's different from the dark brown masoor, or akkha (whole) masoor that Parsis use and that K loves. K was not familiar with our orange masoor in her Parsi home and this was a new experience for her. She quite liked this Bengali favourite when she first tasted it and it remains a favourite of her's 15 years later. I like to cook masoor dal in the pressure cooker now, as the dal blends more evenly, and then temper it with tarka. K prefers this microwave version though because of the granular texture and slight bite of the lentils. The dal is extremely simple to make. Takes very little time and effort. It helps if you soak the dal for at least 20 minutes in water before cooking. Which is not much to ask really even if you have made sudden plans to cook. The dish uses minimal spices. That's where a good quality dal helps. 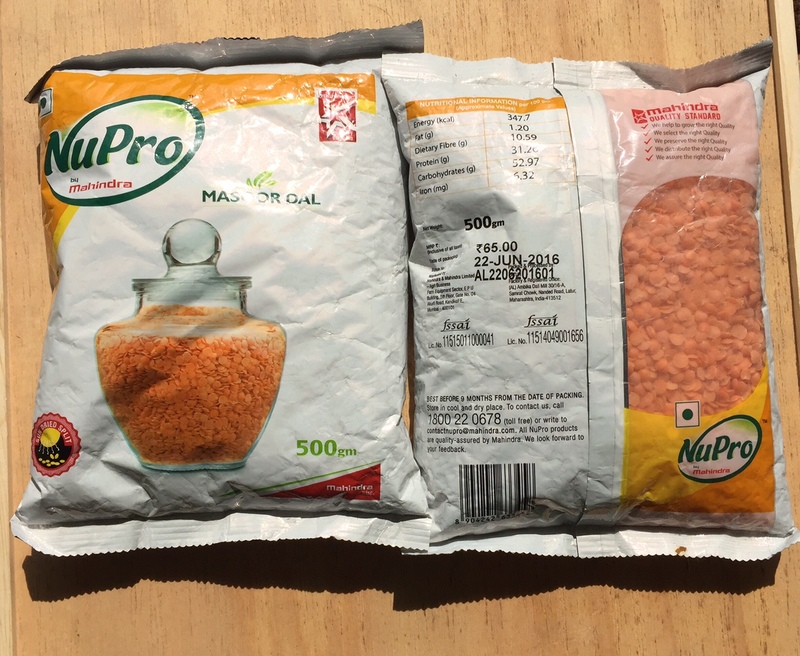 I tried the new Mahindra Nu Pro dal and was impressed by the fact that it cooked in about 14 minutes versus the usual 20 odd minutes needed for the unbranded dals that I got from the grocer. The pulse grains were fairly well formed and the lentils in the finished dish offered a pleasant bite, a mark of good quality. There was no dust or stones in the dal so cleaning it at the start didn't take much time too which helped cut down on the cooking time. Here's the recipe of the dal. At times K has this dal with just bread or even by itself on a no carb day. I steam rice at times and have it with the dal and some aachar on the side. I like to add salli, the Gujarati version of our alu bhaja, which you can buy in stores. Or grilled or fried fish on a good day.